I held the five pound bag of rainbow carrots, in my hand knowing we couldn’t possibly eat that many carrots, but rainbow carrots are fun, and it was quite a good deal. I couldn’t resist. When I got them home, I looked at the big bag of carrots, and shrugged. What was I thinking. Then I had a great idea. I used my food processor to grind up the carrots one color at a time and bagged them up by color. Then yesterday I was looking for a quick lunch and happened upon a can of chicken in the cabinet. I got out the mayonnaise and the hot dog relish I like and wondered what vegetables would brighten the chicken salad. I had three different colors of carrots in the freezer to choose from. Hmm. Orange would look best with the yellow bell peppers, and baby kale. Any combination of colors would do, but I like some green with some lighter colors. ​​​Why all the colors you may wonder? The habit of adding a variety of natural colors to each meal is pleasing to the eye, inviting to the palate, and provides a variety of nutritional benefits. 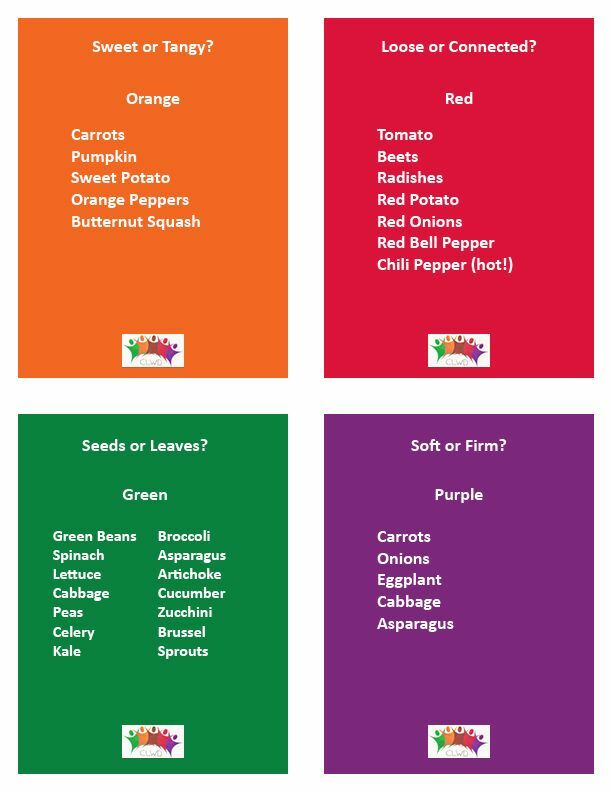 Look at the list of vegetables on the vegetable cards, and check to see how many colors you have in your frig. Do you need to add more fresh vegetable colors? They are delicious fast food that you can eat raw or add to any meal.